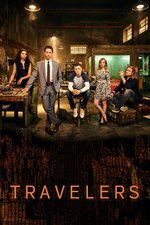 An incoherent homeless man turns out to be a brilliant but delusional traveler who knows the identity of the team's powerful nemesis, Traveler 001. *At a gala fundraiser in 2012, Original Grant MacLaren bumps into Vincent and spills his drink. While he goes to get a new one, Kat introduces herself, and tells Vincent she donated a chair for the auction. When she points it out to him, he sees paintings of the future, and is told they were created by a patient. *Back in the present-day 21st, David brings Marcy to find the artist, who is a homeless man suffering from paranoia/schizophrenia, who claims to be 'on a mission for the director'. As Marcy sees new paintings on the concrete, Simon appears, recognizes her. *At Ops, Philip looks in the mirror and sees himself doubled in projection, and takes his pills. Carly asks him to change the music to something faster, and bops to the music in her kitchen. Jeff gives her a kiss on the cheek goodbye and jokes that she brought it on herself, and Carly seems to have mixed feelings about it. *Driving the family car, Trevor's father tells him he has heard the news about the football coach, is shocked and angry, and that Trevor can tell him anything, but Trevor says nothing happened to him, to his father's relief. *At Ops, the team looks at Simon's drawings. Marcy says that she recognizes him from the institution, in her recovered host memories. MacLaren questions him and from his technobabble they realize he must be a specialist. Simon sees Vincent standing in the room, telling him to shut up. Marcy sees that Simon is drawing Vincent, who Simon says is Traveler 001, then at imaginary-Vincent's urging tries to slit his own throat, but the team subdues him. *In flashback, a normal-looking Simon gets tech from a guy in an alley. When the guy asks what he's doing with it, Simon hears Vincent's voice in his head telling him not to say anything. Later, working at his computers, Simon hears Vincent calling him. In the present, he wakes up at Ops to imaginary-Vincent telling him to leave, and lurking disapprovingly after Philip gives him a glass of water. *At the condo, Kat is woken up by MacLaren searching for the source of a clicking noise at 4am. She points out that it's just the lamps on a security timer, and hugs him and tells him it's her turn to be the one doing well, and hugs him. *At Ops, a naked Simon sees Philip on the computers and is mesmerized by the new interface. In flashback we see Simon working on his old black & white text interface screens, when they are taken over by FBI warning pop-ups. He hears approaching sirens runs for it, then screams out his surrender at the sound of helicopters overhead, but then it is revealed he is screaming to nothing on a quiet street, as bystanders call 911. *At a park bench, Trevor meets with Renee, and when she tentatively suggests maybe things have changed, he enthusiastically accepts her breaking up with him. *Philip coms MacLaren at the FBI office to come back to Ops to see what Simon is doing, and MacLaren runs into David in the elevator. David wants to quiz MacLaren on Marcy for warning signs of suicidal behaviors because of the 'medical procedure', but he reassures David that she's fine. *At Ops, the team tells MacLaren Simon is Traveler 004, his mission was to set up the traveler communication infrastructure, but his host turned out to be schizophrenic, it wasn't in the historical record because it didn't manifest until after the host's original TELL. Philip explains that the internet backchannel they use has additional layers, which Vincent has been using to spy on the travelers, but now that they know they can use it against him. *In the flashback, Dr. Carroll takes Vincent to meet Simon in the facility. Simon recognizes Vincent's voice as Traveler 001, and says he was supposed to die in the North tower, but Vincent tells him that the Director assigned him a new mission, that he is supposed to make Simon whole. *At Ops, monitoring the backchannels, the team sees that a non-encrypted phone calling Vincent. We see that it's therapist Dr. Perrow calling, she wants him to agree to other forms of treatment like medication, and when he refuses says she is canceling their next appointment. *In flashback, Dr. Carroll expresses concern to Ingram over the equipment he has brought to the facility, and he bribes her to handle the board and regulations, and enters the 'treatment' room where Simon is working on the consciousness transfer devices. *David comes home to find Marcy attempting to make dinner, happily oblivious to the mess she's made of his kitchen. They kiss, and abandon the mess (though David shuts off the stove). *At the FBI office, Kat finds MacLaren working late. She asks him to choose a country for them to take a long vacation to, but when he shows reluctance to be away from work, she shows him an adoption brochure and asks him to consider a different kind of drastic change, and he seems willing. *At Carly's, Jeff comes home drunk, and tries to put the moves on Carly, getting violent when she resists, and Carly fights back. He hits her in the face with a barbell, and she beats him into unconsciousness, only stopping when Philip singing on coms snaps her out berserker-mode. *At David's, in bed the morning after, Marcy tells him she remembers things like the time he and (1.0)-she played Operation, and tells him that she loves him. *At Ops in the morning, Carly asks Philip how he knew to interrupt her at that moment, and if he knows what would have happened to her or Jeff if he hadn't, but Philip doesn't say anything, and maintains the protocol of keeping the Update secret. The rest of the team arrives and Philip tells them that he believes the source of the burner phone call to Vincent was Dr. Perrow, and Carly and MacLaren go to question her. *In flashback, Vincent tells Simon he needs to complete the device. Simon tells him all the things he would need, and when Vincent explains that they can't get any of them in the 21st, Simon tells him to just ask the Director for the materials. Vincent says the whole thing has been a waste of time and they're finished. Simon says they've hurt so many people, they hurt Marcy, and keeps begging him to just ask the Director, as Vincent leaves. Later, Dr. Carroll confronts Vincent about the news that he is withdrawing all funding from the facility, and says it will mean patients ending up on the streets, and he suggests she use some of the ample 'alternative funding' he's been giving her, if she cares so much about the patients. *At Carly's, Jeffrey awakes to discover his battered face. *At Ops, Marcy, Philip, and Trevor watch Simon. Philip wonders why the Director didn't send Simon help, and Marcy says it must not have known the host was compromised, like Marcy and Philip's were, and that Vincent made sure none of the facility records made it out of the 21st. Simon says he wants to go home. *At Perrow's office, MacLaren and Carly tell her they know about her patient, Vincent's, delusions, and that he is becoming dangerous, and ask her to restore her appointment and carry a device they can track and monitor her with. *Marcy takes Simon back to the streets she found him on. He says he's glad she's better, thinks that the device in room 21C is what restored her, and hopes maybe he can be made better too. *Dr. Perrow waits nervously on the street, and is picked up by one of Vincent's security cars, while Philip monitors the tracker on a tablet and MacLaren, Carly, and Trevor drive after the signal from a distance. Perrow activates a her com (by accident? ), says she's fine and tries to pretend she was talking about the weather when the security guy glances at her. *As Simon makes another drawing on a sidewalk, two men grab him and drag him away. *When Dr. Perrow's signal stays stationary at a barn, MacLaren, Carly, Trevor enter to find that her com has been cut out and left behind. Back at Ops, they watch a video message from her to MacLaren, saying that she was acting in an unsanctioned operation, and that she and her daughter will be released unharmed if MacLaren presents himself, alone, at a set of coordinates within two hours. At last, the other Jeffrey shoe has dropped. While I'm sure it's not great representation for one of the few black men in the series to be the violent abuser, I don't think it would be great representationally either if he got 'cured' by Carly standing up to him, or having her fall for him. I'm sure there's more to say about this episode, but, I need to move on to the finale asap! Which one was 0059 again? The Jeff character has been completely unsympathetic the entire show, even/especially when he's been "on best behaviour." But, yes, problematic portrayal of black men. He's also a cop. So, well, scumbag domestic abuser alcoholic cop. It rings true about domestic abuse in that it almost always escalates (well, in the prime timeline he's already beaten Carly to death once already, this time with something that could be argued as a lethal weapon) if something is done about the behaviour (such as leaving and maintaining no contact). This episode felt a little rushed, which is understandable if they're hedging Schrödinger's greenlight/redlight of S3. The big with Trevor and Gary in the car - it was a little roller coaster watching Gary process Trevor's responses. Also, I am shocked that Vincent actually met Mac and Kat. I assumed he'd researched Mac and seen the pictures from the gala and was just bullshitting him. The coordinates for the meetup are in the Seattle metro area. Man, I wish Carly had killed Jeff even if it meant she went to jail. That guy is a horror. Gee, and you wonder why she didn't want you to drink? But...go Phillip, I guess. Yeah, it's boggling that the Team can't/won't pay for a 3rd party childcare provider.